← >Trailer Park Yoga video? • Beginning classes (for technique and basics) aren’t much of a workout. • Power belly classes (the basic moves done in rapid succession while wearing a 10-pound weight belt) are pretty effective as aerobic, fat-burning exercise. And they are very easy on the joints. • Two-hour performance classes (done for endurance and skill) can be quite strenuous. They’re good for burning calories, but watch out for repetitive stress injuries (and other injuries) to feet and ankles if performances are done on non-studio surfaces, such as concrete or asphalt. • Performances are exhausting. Even your face muscles will hurt from smiling for two hours. 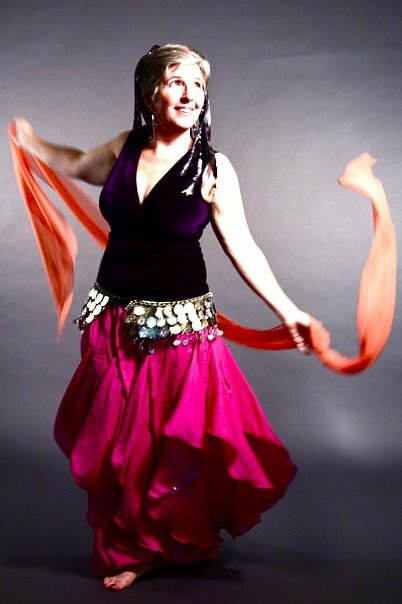 I haven’t tried tribal-style belly dancing, but based on my experience with mainstream belly dance performance classes, I have high expectations of them for aerobic benefit. Tribal troups do a lot of fast traveling across stages. Belly dancing twice a week has not kept my muscles as toned as a similar amount of Vinyasa-style yoga did, so that is a disappointment. But it certainly can and does burn fat. I’m going to try to do it once a week as a good (fun) workout to mix with yoga.